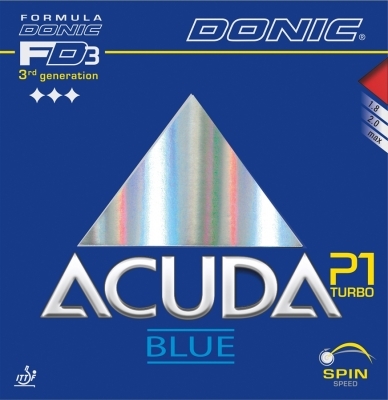 **NEW** Donic Acuda Blue Range is the latest table tennis rubber development from DONIC. This Turbo version has been aligned for the uncompromising attacker who expects optimum speed and power combined with best possible control. The P1 Turbo is the most dynamic and hardest rubber from the Acuda series. Recommended for all out attacking topspin player. Very fast and extreme spin generated by the hard sponge and grippy rubber top sheet.